The cloud and mobile are changing our societies in phenomenal ways. The increased usage of smartphones, tablets, and cloud computing is presenting organizations with new business opportunities and challenges. Companies worldwide in every industry are finding that they can expose new and existing data as Application Programming Interfaces (APIs) to open up new markets and penetrate deeper into existing ones. At the same time that orgranizations are changing the way that they expose data, they are also having to rethink how they are securing it. The old method of hiding it away behind a network firewall is no longer sufficient. Figuring out the best way to secure Cloud APIs can be difficult. 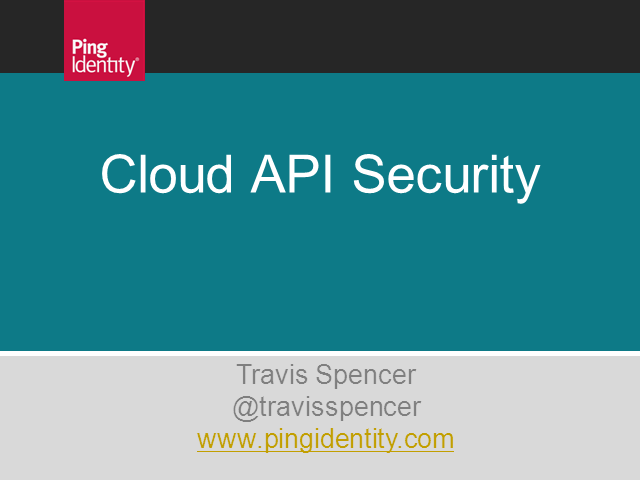 To shorten the learning curve and help you begin taking advantage of APIs, Travis Spencer, Senior Technical Architect from Ping Identity's CTO office, will present the state of API security, recommend best practices, and give advice on how to securely launch and run Cloud APIs. These will help you quickly take advantage of the new possibilities while simultaneously managing the associated risks. Travis Spencer is a Senior Technical Architect reporting to Ping Identity’s CTO. He has over a decade of application development experience which includes the design of large-scale service-oriented and federated systems. His experience federating SaaS offerings with some of the world’s largest financial institutions coupled with his low-level understanding of federation protocols (e.g., SAML, WS-Trust, and WS-Federation) has allowed him to help numerous companies successful begin using cloud computing. His knowledge of OpenID and OAuth also provides him with a unique perspective on the relationship between enterprise- and consumer-grade digital identity management.